Only a few days after the Iranian New Year (Nowruz) heavy rainfall caused flash floods across Iran, affecting 25 out of 31 provinces of Iran including Fars, Lorestan and Chaharmahal and Bakhtiari. The extent of the damage is yet to be determined as the rainfalls continue and the flood continues to hit more cities in Lorestan. As of 1st of April, at least 45 people are dead and more than 200 injured. 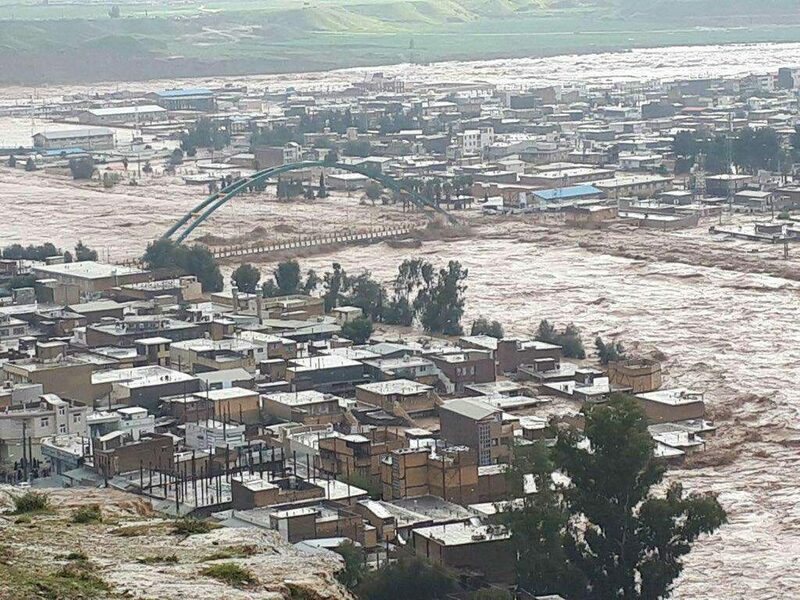 Flood in Pol Dokhtar, Lorestan, Iran on 1 April 2019. So far, the southern city of Shiraz and at least four western cities in the province of Lorestan including Khoramabad and Pol Dokhtar have suffered extensive damage. The government has been urging people to evacuate entire cities and villages and cancel trips amid forecast of more rains. Iranian social media were full of videos of piled up cars, houses, bridges, infrastructures and entire communities being washed away by the flood. The flooding has sparked recent debates on the effect of global climate change and the water mismanagement in Iran. Many are arguing that the recent rainfalls are due to changing patterns of climate and that the Iranian government is not ready for managing this changing pattern. 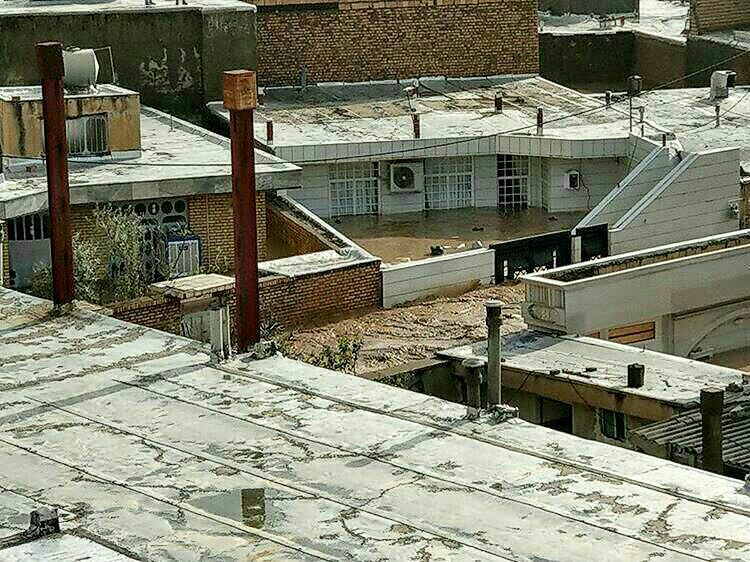 A number of flooded houses in Lorestan. Heavy rain is expected to continue and the spike in water levels in the rivers originating from the Zagros Mountains in western Iran is excepted to travel south overflowing dams and more rivers. The river in the middle of the city of Pol Dokhtar had crested over 3-4 meters above the banks, engulfing houses in water with citizens stranded on the roofs. Flood-stricken citizens are puzzled as in the past year most agricultural communities in Iran were fighting to survive severe drought conditions. They are now asking when are the wet conditions going to subside and if there is an increased risk of more floods in the future. It is unexpected for Iran to experience such heavy precipitation but if the reality of climate change is uncertainty, then how can governments plan for the management of floods? Prof. Moors thinks that in extreme cases, “it is rather difficult to take the measures necessary to prevent damage to infrastructure and loss of life.” However, he also thinks that policies can be put in place to reduce the impact. The impacts of climate change and the uncertainty that is creating in the rainfall patterns is a global problem according to Prof. Moors. “If we look more locally, we see increasing rain showers in the Netherlands. These are not as intensive as those that you see now in Iran but are clearly happening more frequently than expected. This is partly related to climate change, but also partly to urbanization. What you see is that such high-intensity showers very often occur close to urbanized areas. This happens here in Europe, but also in Iran and other parts of the world,” Prof. Moors says. On 1 April, Iran declared a state of emergency in Lorestan. The flood damage in Lorestan is still unclear but the over 80% of the city of Pol Dokhtar is under water. Evacuations were underway even on the early hours of 2nd of April as dozens of villagers were left stranded on their rooftops. 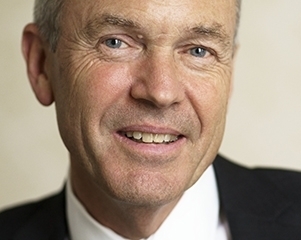 *Eddy Moors is the Rector of IHE Delft Institute for Water Education. Prior to this he was head of the research team of ‘Climate change and adaptive land & water management’ at Wageningen Environmental Research (Alterra). He is also Professor of Water and Climate at the Vrije Universiteit Amsterdam where he has specialized in the research of climate change mitigation and adaptation. I am a geologist and I’ve studied on soil horizons and sediments in my many trips to any corner of Iran, Iran always has been a country of flood and dry seasons due to shallow water level (Iran is a Plateau high altitude subcontinent). It is funny to say “flood crisis in Iran” – like it is funny to say “snow crisis in north pole”! furthermore, there have been long Droughts in oral (and official) history of Iran and you can see Qanats all over the country. Nowadays we are in a (at least) 50 years long drought and if it is the end of this drought, we will see much bigger floods in the future.